Mind the Gap – Digital Talents are scarce. Win the war of talents by accessing, growing and retaining the best talents within your ecosystem – before your competitor does. Shortage of talents – 54% of companies believe that their shortage of talents is hampering their digital transformation causing a loss of competitive advantage. Lacking development – 59% of employers say their organization lacks employees with soft digital skills and more than half of the employees don’t believe in company’s trainings program. High attrition – 55% of digital talents are willing to move if they feel their personal development stagnating. As our studies on the digital talent gap show1, companies acknowledge a widening digital talent gap – and it keeps on growing. Our strategic talent framework combines different offerings to attract, develop and retain digital talents so that organizations truly profit from the digital transformation. Attracting digital talents requires an overall, aligned talent strategy. A workforce analysis identifies your organizations’ digital talent gap which is addressed by creative recruitment and selection measures. 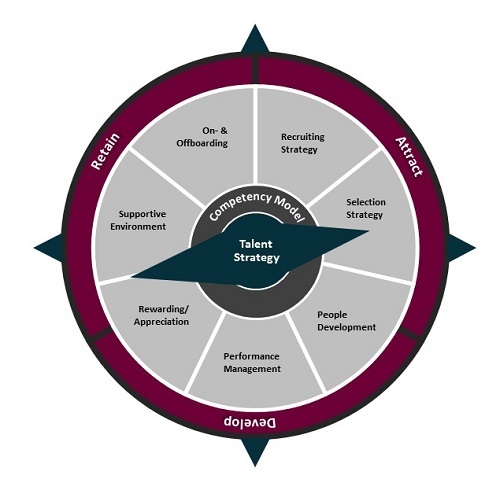 As a basis for Developing digital talents, an underlying competency model summarizes all competencies relevant for future organizational success. An innovative learning and development approach supports the building of needed digital competencies and foster knowledge exchange. Retaining digital talents is accomplished by establishing a collaborative working environment with room to fail and grow and by designing a memorable employee experience. What differentiates our talent offering from other solutions? We believe in an agile, iterative approach to talent. This enables a high customer fit of our wide variety of assets and experiences. Moreover, it ensures a higher employee experience and engagement, which is another success factor for retaining talents – engaged employees are 52% less likely to leave2. Thus, if you are looking for a state-of-the-art talent management, Capgemini Consulting is the right partner for you. The Digital Talent Gap – Are companies doing enough? The challenge of the digital talent gap is no longer just an HR issue; it is an organization-wide phenomenon that affects all areas of the business. Find out more about our worldwide, cross-sector research program in collaboration with LinkedIn or download the findings in Infographic form.